Fishing heavily pressured suburban waters is never an easy task, especially if not all areas of the lake are fishable from the available bank space. My last session was no exception. Arriving Friday after work, I quickly set up my rods and got on the boat looking for my quarry – they were nowhere to be found to say the least. All the areas I normally fish on the lake were dead quiet; no fish were breaking the surface anywhere. This was a bit odd, as the fish are normally very active just before sunset. Nevertheless, I found a nice looking area in the open water with a relatively clean bottom. There was a bit of silt present, but from past experience I knew that the carp do sift through the silt looking for food. Baiting up with about 2kg of 18mm homemade spicy salmon boilies, I left the area feeling confident that I would draw the fish into the swim. Around 2am that morning, I decided to call it a night and hit the sack. Saturday morning around 7am, I was woken by a few beeps on the left-hand rod. To my annoyance, it was just a coot messing around in the margins. The night had passed with absolutely no action – very out of character for the venue, as it holds a very large population of carp. Looking out over the lake, there were no carp to be seen on the surface anywhere. I decided to bait up the margin without fishing it during the day, hoping I could trap a few carp in passing. Late the afternoon, my friend Christiaan had a lovely fat 8,72kg carp from the margin I had been feeding the entire day. I moved one of my rods to the margin also, fishing with a Hinged Stiff Rig and a single 15mm popup. It was looking promising for the night. I knew the smaller fish always hold up in the reeds, so I opted for a really big boilie as a hookbait – hand rolled, probably around 28mm. Freebies consisted of 18mm spicy salmon boilies (whole, halves and crumbed), hemp seed, buckwheat and half a tin of tuna. The rod went out just after sunset. The area where I saw the carp earlier was very silty, but I managed to find a nice hard spot about 30cm from the reeds. It was a very risky move as it was about 450m out from where I was sitting, and I would have to fish locked-up with my pod standing waist-deep in the water. While all this was happening, Christiaan had a few more from the margin but nothing big, and my margin rod was still dead quiet. After sunset things went quiet again, and there was no point in sitting around in the cold, so we hit the sack early. At 2:15am, the rod tight against the reeds gave a few quick beeps. Scared that it might tip my pod over, I quickly got into my waders and made a dash for it. Not sure if the fish had actually been hooked, I was risking looking like a total noddy! Halfway there it was apparent that the fish had hooked itself as it was bending the tip nicely. Now in overdrive, it probably sounded like a hippo charging my pod. Somehow, the fish did not snag in the reeds and it swam for open water. After an approximate 20-minute fight, I had banked a flawless common – what a result after all the effort. With my adrenaline still pumping, I decided to re-bait and place the rod in the same spot once more. Early Sunday morning we woke to a very misty morning. As we had been planning on leaving early, the kettle was out nice and quick, and a cup of coffee was the order of the day. As I was sitting on my bedchair enjoying a warm cup, watching the rods, my right-hand rod suddenly dipped and the alarm squeezed out a few beeps before the line tightened and locked up. This carp meant business. I knew there wasn’t time for the waders, so I crashed into the freezing water. Again the carp opted for the open water to my relief. This one wasn’t going to be an easy land as he soon realised he had the upper hand and bolted for the reeds to the right. Taking the safe option, we got on the boat and fetched it before it snagged up. It was another stunning common on the bank. After a quick photo session, the fish was released and we hit the road. This was undeniably one of my more memorable sessions as I’ve been having a difficult time getting into decent fish lately, and I had an absolute nightmare session before this one. 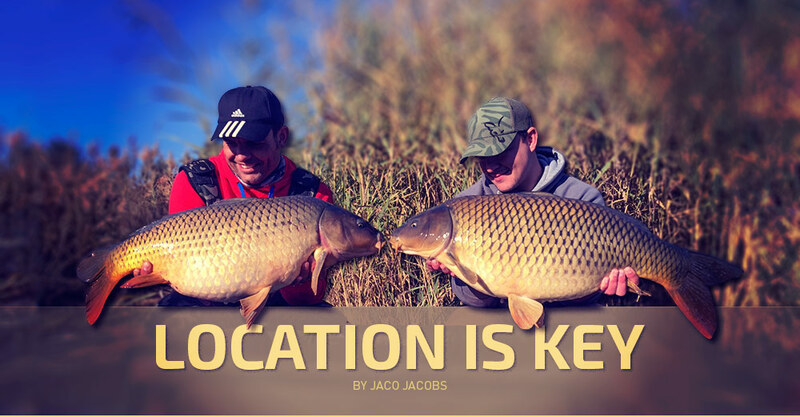 Persistence had finally paid off – once again illustrating the importance of location. If I didn’t make the crucial move to fish the uncomfortable spot, I might have gone home empty handed again!